[PDF] The Art of Negotiating: How to Become a Skilled Negotiator [Audiobook] | Free eBooks Download - EBOOKEE! Description: Product Description: Gerard I. Nierenberg calls negotiating an art. And as a world-renowned negotiator, he should know. The Financial Times of Canada referred to him as the "American Negotiation Guru," the Wall Street Journal observed that he makes a profession of convincing adversaries that nobody has to lose, and the editors of Fortune wrote that he "discovered the depth of interest in negotiating some years ago." "Whenever people exchange ideas with the intention of changing relationships, whenever they confer for agreement, they are negotiating," he observes. "Yet negotiating is one of the least understood arts in human affairs." To remedy this situation, he began his pioneering efforts to define, structure and teach this critical art. 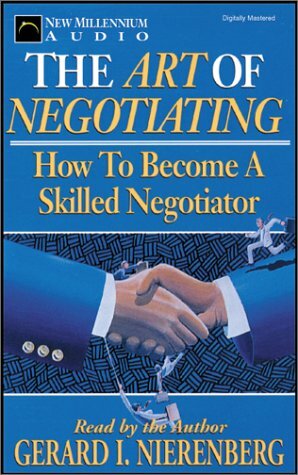 No comments for "[PDF] The Art of Negotiating: How to Become a Skilled Negotiator [Audiobook]".